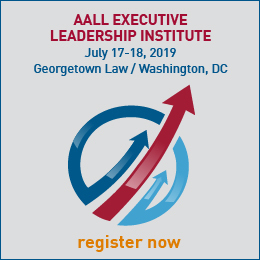 Smaller in size and less formal in structure than special interest sections, AALL caucuses connect members with more focused areas of interest. Don’t see your particular interest below? We may have a special interest section for you. Caucuses have leadership and other volunteer positions that are a great way to get involved and grow professionally while expanding your network. Caucus memberships are open to all members at no charge. For more information about joining an SIS, please contact the AALL Membership Services Manager at 312.205.8022. The AALL Animal Law Caucus was formed in 2010 to support the efforts of law librarians, academics, and practitioners in the research, teaching, scholarship, and practice of animal law. Its purpose is to recognize and further the ongoing work of AALL members in this growing area of law. raise the profile of the field of animal law. The object of the AALLC shall be: to provide a forum for the exchange of ideas and information on, and to represent its members’ interests and concerns within the American Association of Law Libraries (AALL). It shall promote law librarianship; promote the study of Asian law; develop and increase the effectiveness of Asian American law librarians; foster cooperation among Asian American members of the profession; and provide for the further continuing education of Asian American law librarians. Founded in 2005, the Black Caucus of the American Association of Law Libraries (BCAALL) enhances the professional experiences of African American law librarians. The purpose of the Black Caucus is to promote the professional development, recruitment, and social interests of black law librarians. BCAALL members are librarians from a host of different types of law libraries. BCAALL is an inclusive organization. Membership is not denied to anyone on account of race, color, religion, gender, age, national origin, disability or sexual orientation. The purpose of the Conference of Law Library Educators is to educate and inform law librarians who teach courses in library and information school masters’ programs and those who are interested in the educational preparation for our profession. 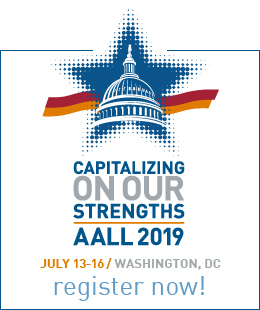 We meet once a year at the AALL annual meeting to discuss new trends in law librarianship education, a status update from each of the major law librarianship programs in the US, and other topics of mutual interest. Serves as a clearinghouse of information on document delivery issues, including but not limited to interlibrary loan, commercial document delivery suppliers and resource sharing; solicits input and comments through meetings and web-based discussions; open to librarians from all types of law libraries and document delivery vendors. encourage law librarians to expand their knowledge of trends in empirical research, empirical research methods, and multidisciplinary resources related to legal topics and research. provide a forum for sharing knowledge related to empirical research including development and archiving of data, availability of existing data, and requirements for institutional review boards. To serve as resources and sources of expertise for the AALL and its chapters and special interest sections. To promote collaboration, resource sharing, and best practices among federal law librarians. The objective of the Jewish Law Librarians Caucus shall be to provide a forum for the exchange of ideas and information on Jewish and Israeli law and to represent its members’ interests and concerns within the American Association of Law Libraries. It shall promote law librarianship; promote the study of Jewish and Israeli law; develop and increase the effectiveness of Jewish law librarians; foster cooperation among Jewish members of the profession; and provide for the further continuing education of Jewish law librarians. To provide a forum for the exchange of ideas and information on issues of interest and concern to Latino law librarians and to represent them within AALL. To promote law librarianship and further the continuing education of Latino law librarians, and to develop and increase their visibility within AALL. To foster cooperation among Latino members of the profession. To recruit and mentor Latinos to the profession. The Law Repositories Caucus is a platform-neutral group that supports law repository coordinators by providing a community for sharing information and resources. The caucus provides leadership and guidance on repository issues by looking both in and outside of the law library community to disseminate repository innovation and promote the future of repository work. It also provides professional development opportunities for the law repository community. raise the profile of how libraries contribute to mindfulness in legal education and practice. The aim of the Native Peoples Law Caucus is to provide a forum in which Native law and other issues that impact Indigenous Peoples worldwide can be discussed, ideas shared, information exchanged, and education offered. The Caucus encourages and facilitates the analysis, cataloging, collection, dissemination, management, organization, and preservation of Native law in accordance with cultural tradition. Inspire and motivate law librarians to write articles for legal publications that are read by practicing attorneys, legal administrators, law professors, judges and others in organizations that employ AALL members. Encourage publishing as a way of promoting individual law librarians and the profession. Librarians interested in teaching legal technology in law schools and other settings. Any technology interest and skill level is welcome, the intended focus will be inclusive of any current or future technology used in legal practice.